RaazDawaKhana is committed to supporting customers in their pursuit of health restoration and a happier, healthier life. It is important that you read these Terms & Conditions carefully before using our website or purchasing our products and/or services. You must read, agree with and accept all of the terms and conditions contained in this user agreement (“Agreement”), which include those terms and conditions expressly set out below and those incorporated by reference, before you may purchase through or use RaazDawaKhana.com. This Agreement constitutes the entire agreement of the parties. This agreement is entered into by the customer (hereinafter “Customer” or “You”) and RaazDawaKhana (hereinafter referred to as “RaazDawaKhana,” “We,” or “Us”). Please note that we may amend these Terms & Conditions at any time, without prior notice, by posting the amended terms on our site. It is your responsibility to review these terms for any changes. The products and the claims made about specific products on or through this website have not been evaluated by the United States Food and Drug Administration (FDA) and are not intended to diagnose, treat, cure or prevent disease. 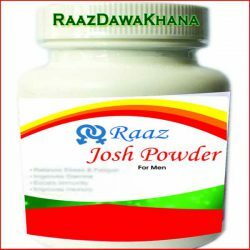 The information provided by RaazDawaKhana through our website and/or product packaging is for informational purposes only and is not intended as a substitute for medical advice from a healthcare professional. Please refer to the website and supplement bottles for warnings about individual supplements. Do not use information from RaazDawaKhana.com to diagnose or treat any health problem or condition in place of any medication or other recommendations from a qualified healthcare professional. Even as you grow in your knowledge of natural and alternative therapies, always work with a qualified healthcare provider. Consult your physician or other healthcare professional before taking or using any RaazDawaKhana products if you have a medical condition or are taking ANY medications. There are certain serious conditions that require consistent blood levels of medications. Any change in diet can cause a change in your blood absorption, and an increase or decrease of the concentration of medicine in your blood as a result. “RaazDawaKhana,” and all logos, page headers, custom graphics and icons are trademarks and/or service marks owned by RaazDawaKhana Our website and email newsletters contain information, data, software, photographs, text, images, typefaces, and other material that are protected by copyrights, trademarks, or other proprietary rights, and these rights are valid and protected in all forms, media and technologies existing now or developed in the future. Any legal controversy or legal claim arising out of or relating to this agreement or our goods and/or services, excluding legal action taken by RaazDawaKhana to collect our fees and/or recover damages for, or to obtain an injunction relating to, RaazDawaKhana website operations and intellectual property, shall be settled by binding single-arbitrator arbitration in accordance with the Commercial Arbitration rules of the American Arbitration Association. Any such controversy or claim shall be arbitrated on an individual basis, and shall not be consolidated in any arbitration with any claim or controversy of any other party. The arbitration shall be conducted in Uttar Pradesh and judgment on the arbitration award may be entered into any court having jurisdiction thereof. RaazDawaKhana may seek any interim or preliminary relief from a court of competent jurisdiction in Uttar Pradesh necessary to protect the rights or property of RaazDawaKhana, pending the completion of arbitration. Should either party file an action contrary to this provision, the other party may recover attorney’s fees and costs. This Agreement contains the entire agreement of the parties. This written agreement supersedes any and all oral negotiations and/or representations of the parties hereto made in relation to this transaction. This agreement neither confers nor creates any rights or responsibilities not specifically enumerated herein. This Agreement shall be subject to and governed by the laws of the State of Uttar Pradesh, with the exception of its conflict of laws provisions. Any waiver or forbearance by RaazDawaKhana of any breach (by Customer) of any provision of this Agreement shall not be construed as a waiver of any subsequent breach by Customer. This Agreement shall be binding upon the parties and their executors, administrators, successors, and assigns. If any provision of this Agreement is held illegal, invalid or unenforceable, such illegality, invalidity, or unenforceability will not affect any other provision hereof. Such provision and the remainder of this Agreement shall, in such circumstances, be deemed modified to the extent necessary to render the remaining provisions enforceable. RaazDawaKhana strives to ship all orders within 24 hours of receipt. Orders placed before 12:00pm (IST) will ship out the same day and orders placed after 12:00pm (IST) will ship out the next day. Orders placed on Friday afternoon, Saturday, or Sunday will ship out the following Monday. Once an order ships, you will receive an email with tracking information for your package. Please allow 5-7 business days for orders within the India, 1-2 weeks to Canada, and 2-4 weeks to Europe and the rest of the world. All orders under the amount of $100 USD will be charged shipping based on the service selected by the customer from the options listed on the website checkout page. All orders over $100 will receive free standard shipping for India. Australia, Austria, Belgium, Bulgaria, Canada, Croatia, Cyprus, Czech Republic, Denmark, Estonia, Finland, France, Greece, Hungary, Ireland, Italy, Latvia, Lithuania, Luxembourg, Malta, The Netherlands, New Zealand, Poland, Portugal, Romania, Slovenia, Slovakia, Spain, Sweden, United States and the United Kingdom. International shipping rates vary, based on weight and destination. Any Free shipping offers do not apply to international orders. The prices stated on RaazDawaKhana.com do not include or reflect any duties, insurance costs, value added taxes, tariffs, or local taxes. RaazDawaKhana.com cannot anticipate or estimate these costs. As the customer, you are responsible for paying these costs; please review your country’s Customs information before placing an order with RaazDawaKhana.com. By ordering from RaazDawaKhana.com, you agree to the policies above. RaazDawaKhana.com reserves the right to change these policies at any time and retains the right to refuse service to any customer at its sole discretion. If you are not completely satisfied with your purchase for any reason, email us at info@raazdawakhana.com or call +91-7454028888 to receive a Return Authorization Form. Refunds are only applicable for supplements bought online at RaazDawaKhana.com. If you purchased a RaazDawaKhana product from a healthcare provider or a retail location, please contact them to discuss a return. If you have any questions or you would like to report a negative experience with one of our retail partners, please contact us. If more than one return is requested by an individual within a 12-month period, RaazDawaKhana may use discretion in processing additional return requests to ensure honorable use of the return policy. If products are missing from your order or you received products that you did not order please contact us at info@raazdawakhana.com or call +91-7454028888 and let us know. If you receive a faulty product (broken seal or expired product), please take a photo and email it to info@raazdawakhana.com. We will do our best to remedy the situation as quickly as possible. Customer Support is available Monday-Friday, 9:00am to 5:30pm (IST).